one of your favorite memories? I used the chalk board. I used the marker board. I had to pull out all the stops. I love me some cutting and pasting. 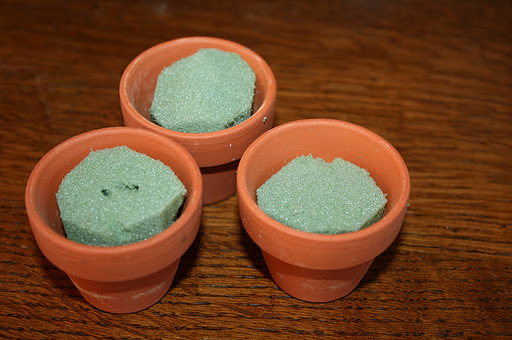 Thirteen little claypots were fitted with a green flower foam. at a thrift store, it made the idea affordable. or just lined up on the floor. Do what’s easiest, fastest and/or cheapest for you. you might want to make them super fancy. you might want to tone the project down. These bags of flowers and circles were in my scrap drawer. I used them to decorate for Grace’s graduation last May. then I glued them on little Chinese take-out boxes. so I was able to make a quick craft out of them. 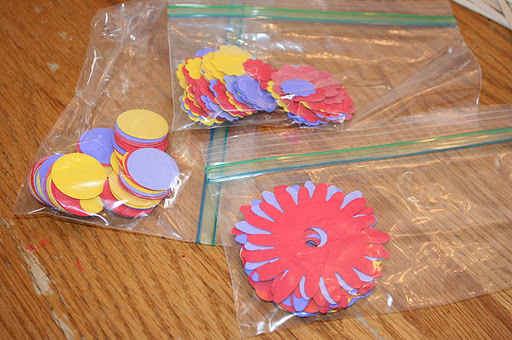 when I first birthed the idea of flower manipulatives. I just never got around to doing anything with them. A commercial break to show you my dirty dining room floor. That stuff will most likely be there tomorrow. and they promptly ate it. The guilty shall remain nameless because I know you’re totally grossed out. we have about a 5 hour rule. OK, I’ll be honest, it’s a 5 day rule. Yea, yer’ right, it’s really like 5 months. 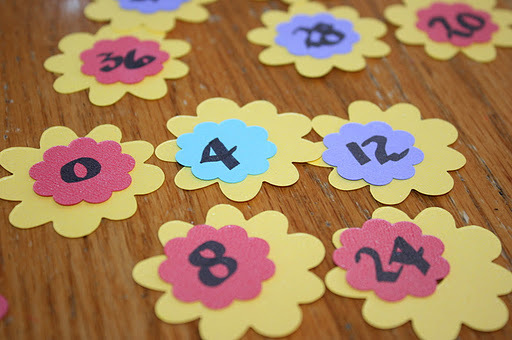 The first set of flowers are for counting by 4’s. Remember how Skipper helped us skip count? This is a skill crucial to learning multiplication facts. 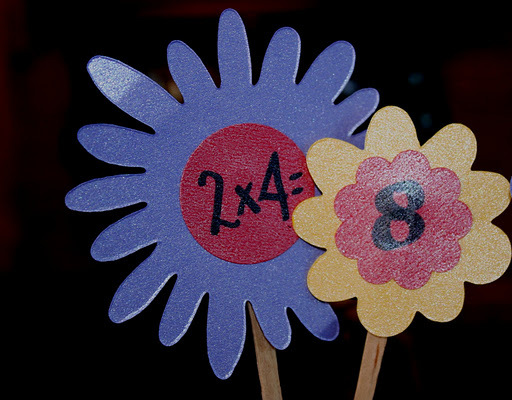 Another set of flowers became the math facts. according to patterns, not the answers. yellow, purple, red, yellow, purple, red. C’mon, loosen your rubber bands, girlfriend! or the money to buy many packages of number stickers. Rebekah started matching flowers in the little flower pots. they made a bright spot in math class. 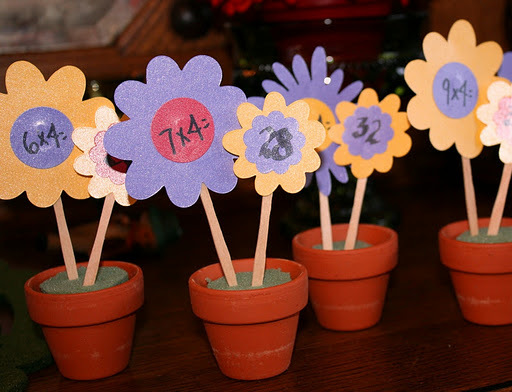 Flowers can be made for each number family. 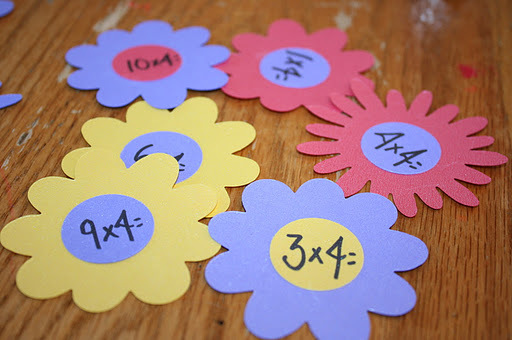 Flowers can be made to show all the math facts with the same product. I have a feeling this project could impact our math class. will be one of her fondest memories. This entry was posted in 3rd grade math, math manipulatives, teaching multiplication on October 18, 2011 by Mindy. There is no "5 Rule" when it comes to candy – especially chocolate. 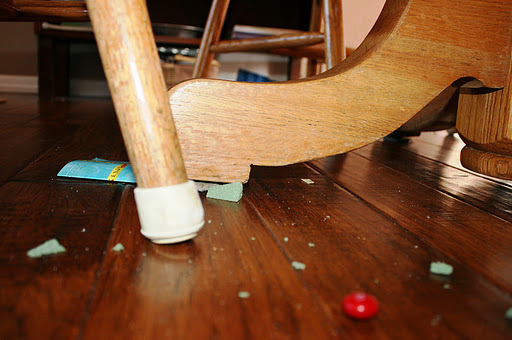 I'da been down on the floor checking to see if any others had slid under the rest of the furniture. I'm gonna keep this idea for my future use, only I'll have to modify it with army guys or something…. I am just amazed at how creative that you are!! 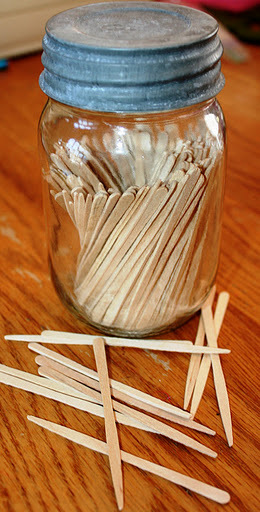 These are awesome and a great way to teach math facts. Thanks for sharing. That's it. One of us needs to move. Wanna live in Alasak? I want Makenna to come school with you. I am to busy chasing her 2 year old brother and trying to help her 5 year old twin sisters read to do cool flower power! Our blond haired 3rd graders could have so much fun together. You are a rockin' cool homeschoolin' Momma.